While taking a break recently from helping a friend clean out the huge walk-in “crawl space” under her home in the popular Buckwater Creek neighborhood of Durham, North Carolina, I was marveling that the property backs up to the forested slopes protecting the Eno River. It occurred to me that I was standing just across the river from an even more unique development by the same builder, a Durham native, and a very early “green” builder. A similar urban version is opening in the Central Park district of downtown Durham. These developments are called co-housing, and Durham’s Eno Commons was the third completed of what will soon be 13 in North Carolina following two in Asheville. Each of the homes or condos are actually individually owned by residents. More than a hundred are now found in nearly 40 of the United States and Canada after the movement started in Denmark in the 1970s. One completed in Salt Lake City about the same time as Eno Commons here is across the valley from where my daughter and grandsons live on the slope of the Rockies. But early Mormon settlers including some of our ancestors experimented with variations of this idea in the late 1800s while other ancestors who created settlements further north along the Rockies and south onto the Colorado Plateau always incorporated the commons. Planning for Durham’s Eno Commons began a few years before the Buckwater Creek development was completed. It was a reality by the year 2000. A park-like neighborhood, it has 22 energy efficient and sustainable households connected by a pathway. Its residents share as commons the surrounding woodlands, an orchard, organic gardens, a playing field and a Commons House, complete with a guest apartment, along with a barn-shaped workshop including shared tools. This is why they are often called “intentional” neighborhoods vs. those in name only. There are many other ways that developments are now incorporating the commons. One which Mugs and I hope to visit after collecting my grandsons on one of our annual cross country trips lies north of Eagle, Idaho where Dry Creek flows down from its headwaters near 7,000 ft. Deer Point, along the Boise Ridge and out under State Route 55. Before heading up the western edge of Idaho past Cascade Lake on our way to the northern Rockies where we rendezvous with family each year, we will detour four miles up the creek valley to Hidden Springs, Idaho. This master-planned community was launched in the mid-1990s about the time Buckwater Creek in Durham was completed. It just reached build out during the last couple of years. Hidden Springs is an almost 1,800-acre community of about 850 homes in five neighborhoods with a population of a few thousand residents, half of whom had already been Idahoans in this most conservative of states. The home designs are neo-traditionals with garages accessed via rear alleys. Along with its own water treatment facility and a mercantile/village green, 55% of this tiny community or more than 1,000 acres is open space. This includes 44% of the overall development or 800 acres that is permanently preserved as forested and afforested areas including wetlands and other commons managed by a conservation trust. Included is a native plant demonstration garden, nature trails, a community farm, an environmental education center, an orchard and a historic farmstead dating to the 1860s when Basques similar to those near our ranch in the Tetons. Home sites adjacent to the protected areas usually sold first and at a premium ranging from 10 to 30 percent over other sites. Hidden Springs is also formally certified as wildlife habitat by the National Wildlife Federation. The community is featured as a case study in a book authored in the last few years by Ed McMahon, a friend of mine who is a sense of place expert for the Urban Land Institute. 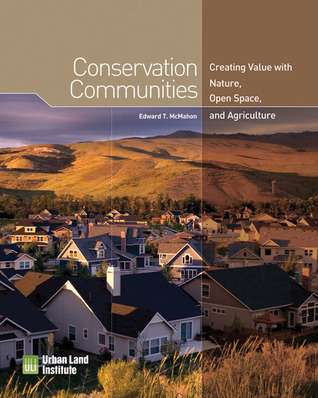 The book is entitled, Conservation Communities: Creating Value with Nature, Open Space and Agriculture, and should be required reading not only for developers, but especially for those few whiners who have the ear of power-hungry regressives in the North Carolina legislature who seem bent on stripping communities of development requirements. Most developers in far more conservative states welcome and exceed these requirements as mere guidelines. McMahon cites a report showing that wooded properties increase home values as much as 20%, and lots with mature trees such as mine or those backing up to forested land have sold more than 50% faster than others. This is the same reason that most of the people who buy homes along golf courses are not golfers. They are guaranteed it will stay a natural area even if it’s not included in calculations of open space. While only 1 to 2 percent use golf courses and 5 to 6 percent use swimming pools, anywhere from 50 to 60 percent use trail systems and pathways. Nearly 60% of homebuyers say they would be more likely to purchase a home near green space. The developers of Hidden Springs now wish they had done even more to protect open space beyond its boundaries according to McMahon whose book is a must read for developers, planners and policy makers. Another good book is one that just came out this year, a series of 25 essays by Asheville, North Carolina native and law professor F. Kaid Benfield entitled, People Habitat: 25 Ways to Think About Greener, Healthier Cities. Benfield’s essays are published on Huffington Post and elsewhere. Most of my essay is probably lost on regressives in North Carolina but hopefully not on the majority of lawmakers on both sides of aisle who aren’t. Two new studies may shed light on regressives. One by a Michigan team of business, psychology and psychiatric researchers found that those who place independence above any interdependence such as ecological are 6 times less likely to carry a dopamine-receptor gene known as DRD4. From those I know, this I presume includes regressives. Another deals with narcissist personalities (self-absorbed or “one-way street folks”.) You know, the folks without any boundaries when it comes to the rights of other people. They are found in much higher proportions in elected officials than in the general population. This group even at the normal range of the spectrum is found to be notoriously oblivious to the societal benefits of the environment. The difference between normal and pathological is that one just doesn’t care about the welfare of others, while the other intends ill will. According to medical professionals, the diagnostic manual lists nine traits of narcissists including arrogance, sense of self importance, fantasizing about unlimited power, seeing themselves above others, having a sense of entitlement, being exploitative, lacking empathy and being envious of others. Because very few North Carolinians are empowered to vote them out of office, it falls on the rest of the legislature to be very wary, to read bills very carefully and to defend North Carolina from being harmed by their excesses, even when only through obliviousness. While only adopted by the state 25 years ago, I dearly love North Carolina and hate to see it stripped any further of the things that make it so appealing. It is hard to see the actions of regressives as anything other than intended harm. The weakness of representative democracy is when the tyranny of the few who unelected by the majority of North Carolinians appear bent on its desecration or perhaps are just ignorant to the intent of special interests pushing them to do so.